Last weekend was Edmonton’s first Hacking Health, a unique event that aims to enable collaboration between technology geeks and healthcare workers to solve health-focused problems. 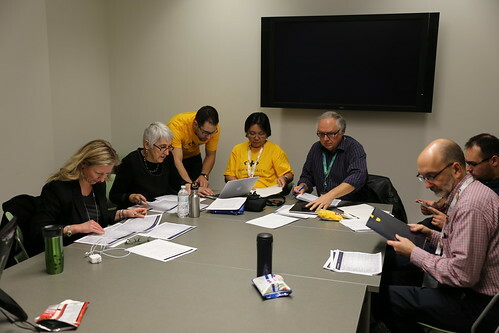 The hackathon took place at the Edmonton Clinic Health Academy at the University of Alberta from Friday evening through Sunday afternoon and attracted dozens of participants and many more observers. Hacking Health is an experiment in collaboration. Our hypothesis is that the interface of front-line clinicians and technology experts will yield innovative approaches to some (not all) of healthcare’s most entrenched problems. By rapidly building and testing prototypes, we can identify the fraction of ideas that have the potential to scale and at the same time, allow others to take their learnings and apply them to new ideas. Our goal is to make this experimentation as low risk as possible for everyone involved – the individual participants, organizers, and supporters. Hacking Health was founded a little over a year ago in Montreal by Jeeshan Chowdhury, Matthew Huebert, and Dominic Savoie. They found the startup scene and hackathons in particular quite intriguing, and felt that such events could have a positive impact on the world of health too. What if they could get doctors, nurses, and other health professionals in the same room as technology experts? Could they reduce the risk of healthcare innovation by giving designers and developers exposure to the healthcare knowledge and connections they lack? Since that first event in Montreal, more than 1000 clinicians, patients, designers, and developers have participated in subsequent events in Toronto and Vancouver. The Hacking Health team have ambitions to spread across the world, starting with Canada. For some additional background, check out this ExpressNews article. It was only a matter of time until Hacking Health made its way to Edmonton, as this is Jeeshan’s hometown (we actually went to high school together). Our growing startup and technology scene combined with an established and widely recognized health sector make Edmonton a great fit for events like Hacking Health. I didn’t have the opportunity to participate in the event, but I did attend the demo session on Sunday. Hacking Health followed the same format as many other hackathons. Friday night is when the ideas are pitched and the teams are formed. If an idea or proposal catches your attention, you’re welcome to join the team. Once that’s done, the teams get down to work, spending all of Saturday trying to make progress on their solution or idea. Sunday is when the teams demo what they managed to accomplish over the weekend. There were 33 projects pitched, 13 of which had teams formed around them. There was quite a bit of variation in the projects and team sizes, which made for an interesting set of demos! Each team had 2 minutes to show off their work, followed by an opportunity for the judges to ask some questions. Health Facility Wayfinding: This team didn’t actually take a technology approach to their solution. Instead they proposed the use of human guides along with signage to help people navigate the hospital. Education for Extracorporeal Therapies: An extracorporeal procedure is one which is performed outside the body. In this case, the team focused on the need to do something with a patient’s blood, and they devised a clamp system using Arduino. It was described as an add-on to existing products, and while I can’t personally appreciate the impact it might have, others in the room seemed excited. Kala: An Emergency Room Wait Time Genie: The idea with Kala was to use machine learning to predict wait times. They demoed a dashboard that would present that intelligence, and said the biggest challenge would be getting access to data from the hospitals. AHS does share estimated wait times, of course. Referral Appointment Dashboard: Called ezReferral, this team’s project would allow doctors to negotiate with one another to simplify the complicated referral process. They are apparently about 80% of the way to completion! LinkRX: This project aimed to build a link between doctors and pharmacists for prescriptions. Using a QR code on a prescription, the team hoped to ensure that prescriptions could not be forged and to make it easier for pharmacists to scan on their end (no more deciphering doctor’s notes). They said pieces of the system already exist, but their project was a unified system. Tracking/Improving Emotional Well Being via Smart Phone: This team built an Android app to enable emotional tracking. The vision is to combine self-reported moods (the piece they worked on over the weekend) with everything else that your smart phone knows about you. StandUp! : This team said “sitting is the new smoking” and their plan to get you up and out of your seat is an app that reminds you when you’ve been sitting for too long. It would assign you an activity, like doing ten squats, that you could invite a friend to join along in. You earn points for completing each activity, and your workplace could pay for data to monitor the health of its workforce. Mis TakeAway: This project envisioned a safe space for health professionals to reflect on their mistakes, a sort of post secret for the healthcare industry. The webpage featured messages in a bottle, each of which contained a confession. CoughDoc: Another simple but powerful idea formed the basis of this app – allow patients to record their cough (or their child’s) using a smartphone and send it to their doctor. The doctor could then diagnose remotely and determine whether an appointment is necessary. Rehabilitation with games using KINECT: Rehabilitation using Kinect is not a new idea, but this team forged ahead with a fun, Super Mario Bros-inspired game nonetheless. They focused on rehab for an elbow injury in their game called Super Reventure World. What’s for lunch? : This app is a tracker for nutritional information. Again, there are dozens of these services already out there, but what made it unique was the interface – users could enter plain English and the app would parse it and convert it to the appropriate nutritional information. Walk-ins Welcome: It sounds like last minute cancellations are a big problem, and that’s what this project aimed to solve. The service would connect patients with last minute appointment times, and would allow doctors to keep track of which patients were no-shows. TrialConnect: The final project was focused on connecting willing participants to clinical trial research. It’s like a matchmaking service for researchers and patients. In the end, CoughDoc, ezReferral, StandUp!, and Walk-ins Welcome were all recognized by the judges as well as sponsors BDC and Bird Communications. I think my favorite was StandUp!, perhaps because it seemed the most realistic and immediately impactful to me. It’s pretty amazing what each of the teams was able to accomplish in such a short amount of time! Everyone seemed to have a great time over the weekend, and it was great to see all of the demos at the end. 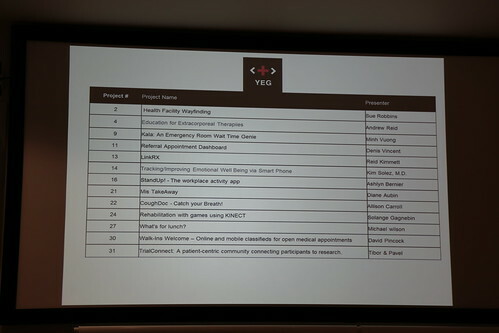 Congratulations to everyone that helped to make Hacking Health Edmonton happen! For more on the event, check out Tamara’s Storify. 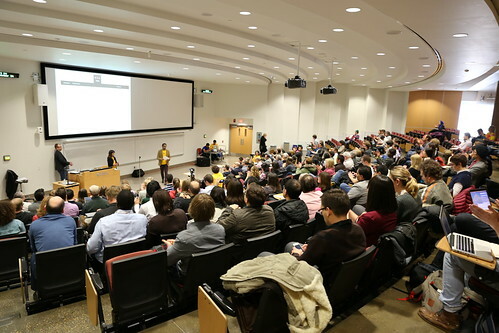 Hacking Health will be making its next stop in Calgary in February 2014, followed by events in Montreal and Hamilton before going international to New York City, Stockholm, and Strasbourg. Here in Edmonton, stay tuned for a second Hacking Health event next fall. You can follow Hacking Health Edmonton on Twitter (they may get a meetup group going too). Check out more photos from the first event here.